Thank you to our 2018 Trifecta Sponsors! 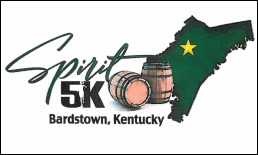 The United Way Spirit 5k takes place on a certified course race that winds through Bardstown, KY. (Click Here for Route.) The race is held in September and coincides with Kentucky Bourbon Festival. Thank you to everyone who made the 2018 Spirit 5K a success! For more information about the Spirit 5K, please contact Dooley Mattingly at 502-827-3472 or Laura Sedlatschek at director@tricountykyuw.org. 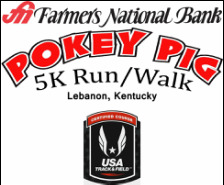 The Farmers National Bank Pokey Pig 5K Run/Walk attracts 800-1000 runners. It features a mixed medium course through the streets of downtown Lebanon and Graham Memorial Park during September. Thank you to everyone who made the 2018 Pokey Pig a success! For more information, please contact Joanna Filiatreau at 270-692-3177 or email. ​The Sorghum Shuffle 5k is one of many events that are held during the Sorghum Festival in September or October in Springfield, KY. Thank you to everyone who made the 2018 Sorghum Shuffle a success! For more information, please contact the Springfield-Washington County Chamber of Commerce at 859-336-5412, ext. 5, OR contact Marlita Tomlin, 5K Committee Chairperson at mctomlin@yahoo.com.